There was a moment in Disney Hall last night that I will not soon forget. 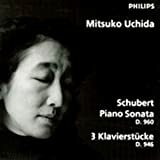 Christoph Eschenbach was playing Schubert’s last Piano Sonata – the B flat, No. 960 in the Deutsch chronological catalog. The slow movement came to its end, a sequence of harmonic magic that seemed to hold the very expanse of the hall in its grip. The ensuing silence was like a physical presence; it seemed to draw the entire expanse of the Hall and its enthralled listeners into a vacuum. Miraculous music, in a performance worthy of its secrets, its mysteries. The overriding mystery is Schubert himself, in his last year, his body – but not his Muse – in the weakening clutch of the disease, most likely syphilis, that would terminate his lifespan at a tragic 31. And the music of that last year — the heartbreak in just the opening phrase of the Fantasy for piano duet, the Quintet for strings that gives me shivers just for thinking of it, and this Sonata, whose slow movement stops our breath with its miraculous key-changes like sword-thrusts into darkness: can we ever fully understand this burst of creative adventure that moved the soul, and the pen, of this tormented, vision-racked genius, so close to the dying of his light. That slow movement may, indeed, hover at the edge of darkness; later in the same Sonata, a final movement comes loaded with marvelous, muscular trickery to send us joyously homeward. There was more. 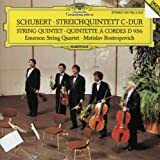 Virtually on his deathbed, Schubert created the outline of a Symphony in D major, and filled in a fair amount: a bright and joyous first movement, an extraordinary slow movement that seems to look ahead to Mahler, a finale full of contrapuntal trickery. 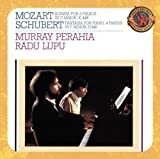 Other hands have brought these sketches to performable estate as a putative “Tenth Symphony,” but even more fascinating is the work of the late great Luciano Berio, who took these sketches under his care and produced an orchestral work of his own, Rendering, which is at once an adoration and a restoration. Schubert’s own music emerges: a beautiful, flowing first-movement melody worthy to companion the analogous moment in the familiar “Unfinished”; the spare, mysterious, cold beauty of the Mahleresque Andante with its warmer episodes of sheer loveliness; the bright and dazzling joyousness – yes, joyousness – of the finale. 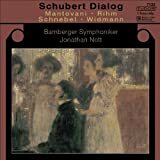 Schubert-Epilog; on both discs Jonathan Nott, the talented young Brit, conducts the Bamberg Symphony. Both discs contain the work of contemporary composers in deriving new scores from manipulating preexisting Schubert material – highly respectful messing-around, in other words.. On “Dialog” we find Wolfgang Rihm’s Sketches On Schubert, built out of the piano accompaniments of several Schubert songs, Dieter Schnebel’s orchestration and expansion of the G-major Piano Sonata and Bruno Mantovani’s jazzy treatment of the galloping piano part from “Der Erlkönig”. The Berio Rendering shows up on Epilog, along with Hans Werner Henze’s “Erlkönig” joy-ride and Hans Zender’s orchestration of several of Schubert’s short choruses. And then there’s the matter of opera. Common wisdom carries an inventory of Schubert’s failure in this area: stiff, artificial, slow-moving. Now there’s refutation, again via Na xos, a DVD of Alfonso und Estrella in a splendid performance, led by Nikolaus Harnoncourt, with a cast that includes familiar names such as Thomas Hampson and Olaf Bar and an unfamiliar name – Luba Orgonasova – as the lovely Estrella, heroine in eighth-century Spain, caught up in a tale of stolen king’s crown, long-lost daughters and traitors forgiven. (Your basic nonsensical Romantic plot in other words). There is gorgeous music here, if not exactly a plea for restoring the opera to the active repertory. This entry was written by Alan Rich, posted on May 28, 2009 at 5:54 pm, filed under soiveheard.com. Bookmark the permalink. Follow any comments here with the RSS feed for this post. Both comments and trackbacks are currently closed. A listening to the Berio left me with the very strong desire that he should dashed well keep his grubby hands off Schubert. That was my first reaction, but I grew to accept what Berio was trying to do: a kind of paraphrase-plus-commentary. He’s done this before, in a big choral piece called “Coro” and in “A-Ronne,” a very wise piece for small vocal ensemble that’s a sort of word-game. You’ll probably recoil from his Monteverdi rewrites, too; I don’t. I admire the quality of his mind. I find the Berio edits/completions to have various levels of enjoyability at first hearing. Something like “Contrapunctus XIX” is pretty obviously Bach and therefore easier to digest, but most of the other stuff I try to appreciate (whether I like it or not) at face value as a Berio work inspired by Composer X. On first hearing, I found “Rendering” interesting if not entirely compelling . . . Based on Alan’s comments, I’ll have to give it some more chances.